You've never seen a globe like this. 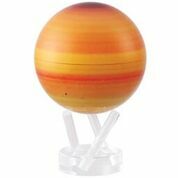 MOVA 's unique spinning globes combine power from ambient light and torque from the earth’s magnetic field to create soothing rotations. No batteries required and no sloppy cords to detract from your enjoyment. Elevate your decor or gift the unexpected. Includes premium acrylic three-pronged stand. Fiery streaks of yellow, orange, and red immediately catch the eye in this recreation of Saturn.